Recently my iPhone has been acting up like crazy- the wifi stopped working and was completely grayed out and my battery was dying constantly. I made an appointment at the Genius Bar at the Providence Place Mall and headed up there last weekend. In Lush I needed to replenish my Celestial facial moisturizer and I knew one of the items I wanted to get while in there was Mask of Magniminty which is a minty smelling face mask. The girl I talked to when I was in there suggested Aquamirablis as a face wash for dry sensitive skin. I bought a small amount of it to try- she suggested about $7 or $8 of it to start off. I will let you guys know what I think about it once I try it out a little bit. It smells AWFUL though. I didn't really get to smell it when I was in the store- so when I got home I took a big whiff and man- it is gross. Oh well, I'll try it out and see what happens. Getting 3 face products was great but of course I can't go into LUSH and leave without a bath bomb (or two) so I ended up getting Pink Bath Bomb (in the top left corner of the picture) and Rose Queen (on the right side of the picture). I'm excited to get in the bath and try those out. In Sephora, I planned to go in and get the Naked Basics Palette. I have the Naked 1 Palette and absolutely love it, but I knew I wanted the basics palette for sure. While in there I decided to look at the Sephora brushes and ended up picking out a brush set. I really don't own many brushes so I wanted to buy the full set. In addition to those items, I ended up buying a Tarte cheek stain in the color blissful. 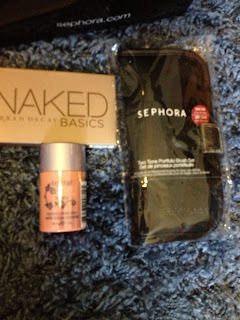 I'm really excited with all these product purchases and can't wait to use them! I ended up in Bath and Body Works because I had a coupon for a free travel size signature item and candles are currently on sale. I decided to get the wunderland shower gel because I have wayyyyy too much lotion and thought shower gel would be a better use of a free product. I ended up getting Poolside and Palm Beach cooler as my two candles and they smell DELICIOUS. I can't wait to burn them! I also had a coupon for 20% off my purchase which made this trip worth it! Finally, I went in the Apple store and they decided my phone was hopeless and instantly gave me a replacement. I'm telling you, the Genius Bar is amazing and I wish more places were as customer friendly as this place!!! Have you been on a shopping spree lately? What did you get?